All the forces from the wind act directly on the rotor bearing in a wind turbine, which means the rolling bearings are subjected to high dynamic loads and harsh operating conditions. A range of powertrain designs have established themselves on the market, each of which requires a different bearing. Schaeffler has therefore optimised its proven bearings while, at the same time, developed new bearing designs for various bearing support concepts. Schaeffler has developed a new, compact bearing unit for moment bearing concepts in rotor bearing supports. The flange-mounted tapered roller bearing unit allows all forces and moments in a bearing to be safely supported due to the large pressure angle and tight axial guidance of the rotor. The double row tapered roller bearing unit in an ‘O’ arrangement, with grease lubrication and seals, is supplied pre-assembled. The inner rings are flange-mounted to the rotor, while the outer ring is flange-mounted to the nacelle of the wind turbine. The bearing clearance is preset, which significantly reduces logistics and mounting costs. As an option, the flange-mounted tapered roller bearing unit can be factory-fitted with FAG GreaseCheck. This grease sensor is set up and configured to the specific type of grease and provides optical measurement of the water content, turbidity and mechanical wear, as well as the grease temperature directly in the bearing support. An analysis unit, which is connected by cable, generates information on the condition from the measurements and transmits these as an analogue signal. If GreaseCheck detects that the water content in the grease has exceeded a defined threshold, it can typically generate two responses: send information to a control room so that plans can be put in place for an inspection and, if required, a replacement of the seal. Alternatively, the signal from the grease sensor can communicate with a central lubricating system via the control room so that the bearings are relubricated at shorter intervals and in greater quantities in order to improve the condition of the grease in spite of the damage to the seals and to protect the bearing from damage due to grease failure. Schaeffler's own large-sized bearing test rig, ASTRAIOS, contributed to the development of the flange-mounted tapered roller bearing unit. While rating life calculations from smaller rolling bearings transfer well to large-sized bearings, this is not so much the case for other parameters such as kinematics or frictional torque. Simulations in these areas must therefore be validated by test results. The measurements are fed back into the simulation models in a multi-stage process so that loads and the kinematic behaviour of a large-sized bearing can be calculated. If, for example, only deformation is calculated, then its effect on the function of the rolling bearing can be simulated and validated on the test rig. Since ASTRAIOS was put into operation in 2011, it has supplied important information on features that could not previously be tested, such as sealing and lubrication concepts, operating clearance (influence of the temperature and connecting screws) and roller speed. 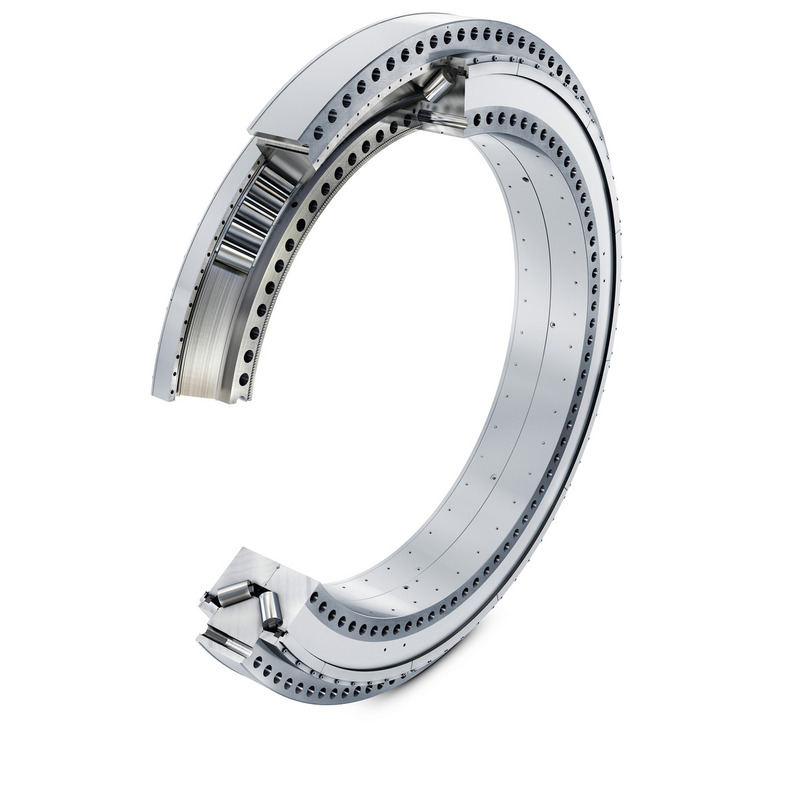 In order to improve reliability, availability and therefore the cost effectiveness of wind turbines, Schaeffler has optimised its spherical roller bearings for main rotor bearing supports. This bearing design is used exclusively on the shaft bearing support – the most common bearing support concept. In order to optimise the bearing, both its micro- and macro-geometry were addressed. The result is conclusive: it was possible to reduce friction and pressures in the bearing, to improve the distribution of forces, and to increase the axial rigidity. These optimised spherical roller bearings therefore have greater resistance to wear, which specifically occurs as a result of axial displacement. These bearings successfully completed a comprehensive range of tests as part of their validation for Schaeffler’s X-life premium quality seal of approval. The validation steps required for this have been certified by Germanischer Lloyd (GL certificate GL-CER-002-2015). This asymmetrical design represents a significant step forward. It substantially increases the axial load carrying capacity and therefore the operating life of main bearings in wind turbines. It allows a larger contact angle to be used on the bearing row subject to axial loads and a smaller contact angle on the bearing row subject primarily to radial loads. This has resulted in improved load distribution, lower contact pressures and a significant reduction in the axial displacement.